The popularity of ORIZONTE – Lisbon Golf, the largest golf course management company in Portugal, and its seven courses in the Emerald Isle is set to soar with TAP Air Portugal and Aer Lingus both operating new services into the Portuguese capital in 2019. From March, TAP is launching a twice-daily service from Dublin to Lisbon airport, while it is giving golfers added incentive to book by offering free golf club carriage on the flights – worth €80 when booking a return flight. ORIZONTE commercial director, José Maria Cazal-Ribeiro, said: “Irish golfers are renowned for their love of the game and their desire to play new, different courses. ORIZONTE – Lisbon Golf’s portfolio offers the chance to play six of the leading courses in close proximity to Portugal’s capital in the beautiful Costa Azul region, together with exceptional value for money on a wide range of accommodation options. 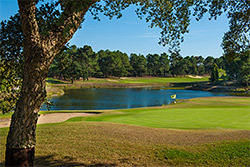 Included among its courses are Quinta do Peru Golf & Country Club, Ribagolfe – regarded as one of the finest in the Lisbon region and was once described as the ‘Valderrama of Portugal’ – and Aroeira, twice the venue for the Portuguese Open and recently included in a list of Continental Europe’s Top 100 Golf Resorts. For more details about ORIZONTE – Lisbon Golf and its 2019 golf packages, please e-mail info@orizontegolf.com or visit www.orizontegolf.com.